One of the highlights for Professional eLearning is coming up next month. 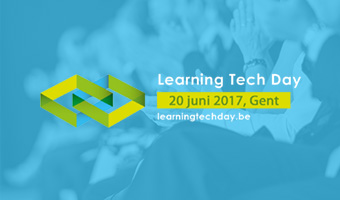 On Tuesday 20 June 2017, Mathias Vermeulen (CEO of Winston Wolfe) organizes the Belgian LearningTechDay an annual event that always seems to trigger multiple ideas. Location: Zebra in Ghent, Belgium. Zebra is a unique project that combines housing, culture and economy all in one. And it has cheap parking space. This is not just any other eLearning opportunity. If you are in the neighborhood and you are interested in eLearning, this is the place to be! The three keynotes alone will make it worth your while: Stephen Downes (integrating MOOCs in corporations), Nell Watson (Artificial Intelligence in all aspects of learning, living and society), and Jamie Good (Neuroscience, habit-building and technology). Although some of the break-out sessions are in Dutch, the keynotes are in English, and I am pretty sure everyone participating speaks English. I will also share a presentation, specifically on the Instructional Design Variation Matrix, an ongoing work which looks at parameters that are often opposite to each other, and bridging these opposites with possible online learning steps befitting diverse instructional design demands. This is slowly but surely resulting in a manual that can be used as a job aid to quickly look for options to implement diverse learning purposes, providing solutions for your own specific learning environment or tailored to your own target population (e.g. master students, informal learners, professional learners). To give an idea, the Instructional Design Variation Matrix lists an array of actions that can be taken to address different learning parameters (individual versus sociaal learning, memorizing content versus challenge-based education, standardized learning versus contextualized learning, just-in-time performance versus long-term implementation, …). Because the designs are linked to different (intended) learning objectives, it enables the online material to be used in a variety of learning trajectories. 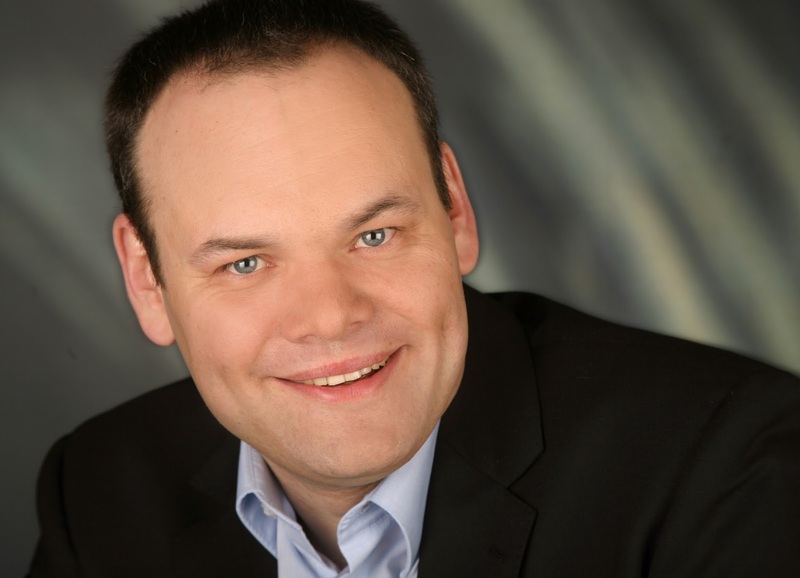 Today I had the pleasure of meeting up with Martin Ebner from the TUGraz, who gave a detailed and critical overview to show how Learning Analytics can support the future MOOC-learner as well as the future MOOC-lecturer. Martin starts off talking abut iMOOX (with an explicit open license (creative commons), so you can use the content for free. EdX license for open courses was a conscious choice. ‘Making’ kreatives digitales gestalten met Kindern (http://imoox.at, another famous one: Gratis online lernen. Which won them the Austrian National Price of Adult Education in 2015. So, to reach all adults a blended approach was used to get the learners from what they new (paper learning) to MOOC learning. iMOOX learning analytics prototype architecture: learners, MOOC platform, learning analytics and prototyping, that was returned to the learners. The webserver did log-files, the data was collected, and the learning analytics server visualised results. 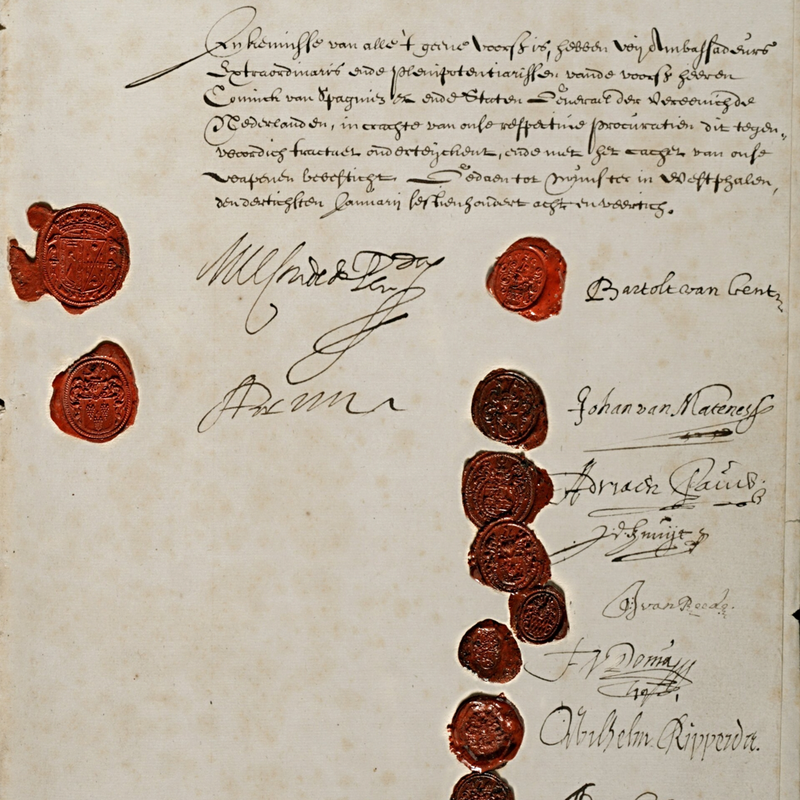 The LA server was developed at TUGraz (Khalil, yeah!!) with screenshots. High dropout rate on MOOCs is a legend: statistics show that it is a myth (referring to Lackner, Ebner, Khalil (2015). Moocs as granular systems: design patterns to foster participants activity, elearning papers, 42 (2015), pp. 28-37. Activity profile is shown: posting, reading, text files, … with different colors for certificate earners. The decline of participation over the weeks. Very similar to other MOOCs. After the first 4 weeks learner activity is quite stable. Video tracking was done, (Khalil, 2016, what MOOC Stakeholders can learn from learning analytics? In Lockee, Childress (Ed.). The video start is seen, but the video end rarely. Learning success:what is it? In many cases learner activity is compared. But not clear link to which activity is related to learning success (not sure if I got this). Learning analytics tells us how learning in classroom happens: social aspects lecture of Ebner was turned into a MOOC. The idea was to open the course to both the students and the public. The course lasts 10 weeks, with regular content, and the learners can choose how to go through the MOOC, and it includes a self-assessment per week. Each quiz could be taken 5 times. Cut-off was 75 % and if you did all the quizzes you got a certificate. When looking at the clusters (Khalil, Ebner, 2016, clustering ptterns of engagement in MOOCs: the use of learning analytics to reveal student categories). University students had highest certification ratio, with high reading, low writing, high video watching and high quiz attempts. (really interesting). Learning happens all the time and can be fun. 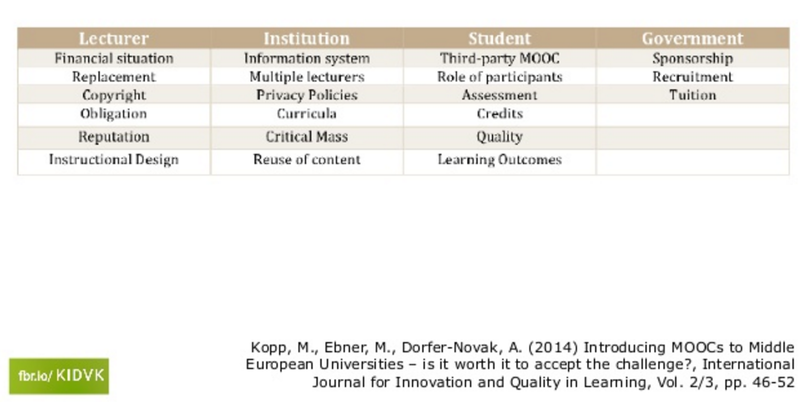 (Lackner, Khalil, Ebner, 2016, How to foter forum discussions within MOOCs, a case study). Then badges were introduced, compliant with mozilla backpack. Badges for quizzes and course finalisation. This was used for the first time in 2015. Learners who did take badges, went for all the badges. The drop out rate was much lower for those learners going for badges, then simply certification. (Inge: is this related to multiple motivation drivers?). Gamification: was done in one MOOC. (Khalil, Ebner, 2016, how gamification can improve your MOOC student engagement). The gamification element got more learners active than in the first week! Never seen that graph in any other MOOCs. (interesting). But one setback with gamification, are those who are no longer active, as these are not engaged in the game. Learning analytics: drop out not that high, get them in for the first 4 weeks, the rest is stable. Remark of Martin on a recent adult learning MOOC, which used local ad-hoc groups that could meet on the subject of MOOCs, which turned out to be very successful (similar to other MOOC groups that were set up). Future actions: bridging MOOCs to prepare students prior to university. An addition to the EdTech options that I am currently organising. A rubric is a grading tool used within a course (blended or online courses) which is used to enable students as well as learners to understand what is expected of them in terms of solving an assignment or reviewing assignments from their peers. Where - within the learning process - can a rubric be used? Typically, as a teacher you will first introduce a case or project (generic example) that is exemplary for a specific process or project (for instance designing an online course overview). Each concept of interest is highlighted in detail. After explaining that particular example of a case, an alternative is given to deepen understanding. Then the learners are requested to build a similar case, yet adapted befitting their own context, infrastructure or conditions. By asking them to build a contextualised case, you bring the content and the assignment closer to their own previous knowledge. To offer guidance you provide a rubric, including the concepts you described in the detailed example. 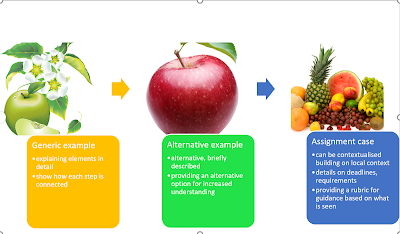 Brief orientation of the rubric: the rubric provided bellow can be used as an example rubric which can be adapted to align the conditions to the course topic. In this case the rubric is used to peer review online course overview. So the assignment include providing a course overview, including content and accompanying assignments consisting of several modules, with one module completely worked out in detail. The overview will provide an idea of the overall structure of the course, the detailed module gives an idea of signposting, descriptions, attained learning objectives. 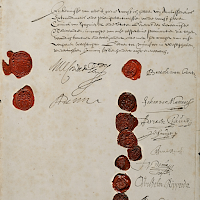 It can be provided to learners prior to having to submit an assignment. That way they understand what the professor will be looking for, what the important criteria of the assignment are, and the rubric will offer a structured overview of how to strengthen a project, proposal or assignment prior to submitting it. A rubric can also be used as a grading or reviewing tool between peers (e.g. learners). A rubric offers a more objective way to review each others work. In addition reviewing each others work will result in a more in-depth understanding of what the project/proposal can be and how your own project can be enhanced by looking at how your peers solve it, or design it. By using a rubric the learners also get an idea of critically looking at other projects, and at the same time knowing the challenges that come along when writing a project based on specific criteria. Which is useful for future project work or collaborations with partners. Using a rubric triggers deeper reflection in the learner on a specific tasks, as well as trigger additional actions concerning the task by integrating the criteria in a project or task. This leads to higher order thinking. This example rubric is based on reviewing an online course project, but it can be adapted to any field using criteria that are relevant to that field and the requested project or proposal at hand. The rubric below is made up out of four grading elements, you can increase or decrease them according to your own preference. In this case I choose to use an even amount of grading elements, as this pushes the learner to make a non-neutral choice, the feedback is either bad or good, not neutral. So you put the learner out of a comfort zone by not providing a neutral option, which would be an option when given three or five grades. In general, once you have a criteria, you will be able to describe a good quality delivery of that criteria as that is typically what a teacher/professor would hope to get from a learner. From there you work your way back towards what you would consider to be a poor quality delivery of that particular criteria. There is no coherent course structure. An attempt is made to provide a course structure, but the course lacks descriptions, has no sign-posting to guide the learner through the course. The course elements are structured, but not all course units are accompanied by descriptions and/or signposting. Leaving the learner to test those course units for themselves. The course is well-structured providing clear descriptions and sign-posting throughout the course, enabling self-directed learning. No learning objectives are given. Learning objectives are given, but they seem to be disconnected from the content that is provided in the course, or they are not covered by the content of the course. Learning objectives are given, but it is not always clear where the relevant content connected to these learning objectives can be found. The learning objectives in the course are all clearly reached by the end of the course. The alignment of the learning objectives with the course content can be traced by looking at the titles of the different course segments. The content is boring, lengthy and non-inspiring. The course content consists of an amalgam of course elements that do not touch any challenges, nor do they inspire to integrate ideas coming from the content into my own context. Parts of the content are engaging and inspiring. Some course units lack mentioning challenges and solutions, but they do provide informative background material. The course is captivating, in an engaging way. It provides consize and meaningful content related to the subject matter, highlighting challenges and solutions related to each course unit. Complexity of the learning path. The course elements are provided chaotically, without enabling the learner to grow as they go through the different learning units. An attempt is made to enable the learner to grow throughout the course, but too little stepping stones are provided in between the course units. The learner isn’t provided with enough background to assimilate new knowledge so they can move to the next course unit and understand what is covered there. The course consists of logical steps, moving the learner towards more understanding by providing new information that supports basic knowledge creation. But some units lack additional, advanced learning material. The course evolves from simple concepts to complex combinations of concepts. Within each course unit there is also a consistent increase of content complexity. Too little assessment is available to enable the learner to self-evaluate their own learning. The assessments provide ample opportunity to see whether the content is understood. However, there are no contextualizable assessments or assignments provided. For example: no challenge or need based assignments. Course assignments can be contextualised given the learner’s background or field expertise. Course assessments are varied and range from simple to complex. The course offers self-assessment options after each larger content segment covering a learning objective. Only one type of media is offered as content throughout the course. The course integrates two different types of media (video and text), but the visuals add nothing to the story that is told. It could just as well be offered in writing. The video is of very low quality, you can hardly see what is recorded. The course uses a mix of media, in accordance with the affordances of that particular media (e.g. discussion paper to increase debate, video of an actual engineering plant described in the course module). Critical viewpoints provided and stimulated. The content only shows the topic from one particular angle and is not critical. The content is infrequently critically analysed by the content provider. The content is enriched with critical arguments, both the challenges and the solutions. Challenges and solutions related to the content are addressed from multiple angles. The learners are engaged to find additional viewpoints, or add critical content. These four calls for papers/presentations and the additional eLearning award opportunity (10.000 – 100.000$) are listed chronologically based on the submission deadline. The University of Naples L’Orientale together with Federazione Nazionale Insegnanti Centro di iniziativa per l’Europa (FENICE), as one of the partners of the project "MOOCs for University Students on the Move in Europe" (MOVE-ME) funded by the Erasmus+ Programme of the European Union, invite you to attend the Second International conference on "MOOCs, Language Learning and Mobility". The conference will take place on 13 - 14 October 2017 at Palazzo Du Mesnil, via Chiatamone, 61 Naples 80121 in a central zone, near the Castel dell’Ovo, the sea and in close proximity to some of the best city hotels. · Increase your knowledge of the topic. · Share results achieved in innovative projects and initiatives. · Meet and network with those having shared interests and goals. · Bring new ideas and concept home to your institution. Conference attendance is FREE for presenters and non-presenting attendees. Download the registration form from the conference website movemeconference.eu and email the completed form to fenice.eu@gmail.com by 30 June 2017 if you are a speaker or by 30 September 2017 if you are just attending..
For more information on the event, the keynote speakers and the call for proposals please visit the conference website. Stay tuned for updates to the conference program. If you have any enquiries, or wish to be added to the mailing list, please write an email to fenice.eu@gmail.com. We are now calling for abstracts for your research-related papers, presentations of case studies, work-in-progress and results of EU-financed projects. Abstracts authors are invited for a 20-minute presentation. Details of how to submit an abstract can be found in the conference website movemeconference.eu. The closing date for submitting your proposals is 17 June 2017. The abstracts and papers submitted will be peer-reviewed by the scientific committee and the acceptance will be notified by 15 July 2017. All accepted abstracts will be included in the conference proceedings and published on the conference website. Info on submission options: please align submission to the session type as shown on the session types and details page. Submission length for session: abstract 50 words, Please keep extended abstract under 1500 words. The Online Learning Consortium organises the OLC Accelerate 2017: Accelerating Online Learning Worldwide, to be held November 15-17, 2017 at the Walt Disney World Swan and Dolphin Hotel in Orlando, Florida. The OLC Program Committee seeks proposals that reflect and showcase our vibrant community of practice — promoting theory, research, methodology and/or applied effective practices in online, blended, and web-enhanced teaching and learning. Both research and evidence-based proposals are encouraged for submission. Note that each individual is limited to no more than three (3) submissions, including the roles of presenter, co-presenter, panelist, or workshop facilitator. The session type descriptions will be helpful to you as you shape your submission. Please review the details on these CFP pages before submitting your presentation proposal. Notifications are sent to all authors on each submission. All submissions are sent notification emails, regardless of acceptance status. Please be sure to “whitelist” emails from the @onlinelearning-c.org domain. If you do not receive a notification email by August 4, please contact us at conference@onlinelearning-c.org. Step 1. Login in or register a user account with the OLC conference management system. When registering, please include as much information as possible in your user conference management system (CMS) profile, including your biography, a profile picture, and most current contact information. All additional co-presenters need to also be registered in the CMS with user accounts. Please keep in mind that once you have registered or submitted a paper, all conference-related information can be found here at the OLC Accelerate 2017 website. After you login and proceed to the conference management system, you will be able to submit a proposal by clicking on “OLC Accelerate 2017” in the top menu navigation within the CMS. Step 3. Review the Strand Descriptions. Step 6. When you are ready to submit, login and select “OLC Accelerate 2017 > Session” to begin. You must be logged in to submit. If you need a PDF of the CFP pages for accessibility reasons, we have prepared a simple PDF of the OLC Accelerate 2017 CFP information. The submission deadline is May 22, 2017 at 11:59pm ET. Thank you for your contribution. We look forward to reviewing your presentation submission. · Platformism: new paradigms for online learning. The theme of this year: Learning Uncertainy: Can we learn to live with it? Can we accept it, manage it and even thrive on it? We live in an age of acceleration. 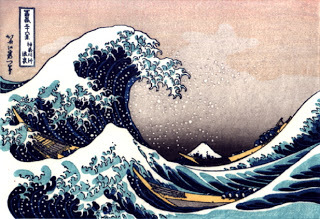 We are in the midst of a sea-change - a profound, transformative shift in knowledge, experience and perception. It is a new era defined by technology, globalisation, information and, above all, uncertainty. OEB 2017 is about acknowledging uncertainty and preparing for it. It is about how transformative education, training and learning can equip businesses, organisations and individuals with the skills to survive and prosper in our new era. Become involved in shaping the agenda by proposing a topic, talk or session by May 29th, 2017. Conference Book of Abstracts 2017. The ISBN number is 978-3-941055-47-6. Deadline for submissions: 30 June 2017. We ask that only those who are serious about truly being innovative, creative, and dedicated to changing the world of digital learning apply for this award. Join us for an informational webinar (optional dates to choose from). The deadline for submissions is 12:00 p.m. ET on June 30, 2017. All applications must be submitted through the online submission portal. Winners will be announced at theOLC Accelerate conference, Nov. 15-17 in Orlando, Florida. Read our recent press release or visit the website for full details regarding the award competition. We look forward to reviewing your submissions, celebrating your successes, and identifying top innovators leading the digital learning landscape. Below are some general guidelines when looking to produce an online course script that can be used to record video content (e.g. 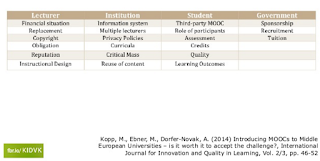 MOOC, blended learning,…). The guidelines are divided into two main sections: timing and narrative script. The timing of the video depends on the purpose of its use. Although there some general guidelines referring to preferred timing, you as a teacher must consider the content of the video in order to consider the timing. But no matter how long (e.g. full simulations of a process) or short (e.g. teaser video, content element) the video is meant to be, a good narrative helps to create an engaging and captivating video (or audio, as a good narrative applies to both audio and visual media). Shortest bit of video: the branding (logo). Keep this to an absolute minimum. Branding should happen in a singular instant. Shortest bit of meaningful info: the course teaser: timing around 2 minutes, see further down this document for specific course teaser pointers. Longest meaningful video content: a full process description at a specific authentic location, explaining a full process demands time. But still, make sure to write a consize, brief script and be really weary of having more than 12 min of video length even for long concepts. Focusing only on what needs to be shared to understand that particular bit of content. (Tip: keep in mind your learners are watching a movie, if a scene in a movie takes too long or does not seem to lead anywhere, their mind starts wondering. If too many scenes are not goal-driven, they turn to another movie). Overall, the length of a video should be kept to the minimum that is needed to describe or illustrate one coherent learning objective. And you must always consider, what does this video add to the content that is needed to understand that particular bit of content which is one learning objective of the full course. Before building a script, think back and try to recall any professor or teacher you have had who gave inspiring lessons… and try to figure out why they were inspiring? Being inspiring enhances motivation. General idea: know what you want to talk about, cut it into consize and meaningful pieces, see how you can build a story with the pieces you have (find a narrative to connect all the pieces together that captures attention). is this content relevant to the topic of the course? does this multimedia segment align with the learning objectives/results you want your learners to achieve with this learning segment? is the story of interest to is it explained as briefly yet meaningful as possible (length can vary, but being consize and to the point is necessary to keep the learners’ attention)? if you want to reuse the material, it is important that the content is self-contained, and not referring to other parts (eg. avoid: “as we have seen in a previous video”, this saves time in the editing room). Why create a narrative script? Because it gives you an overview of what you want to say (or what you want others to say), you can check whether all the elements of a particular subject area are actually covered, and it saves time when recording parts of a course when you are sure all the content is covered (revisions of recorded material can be costly and time consuming). Remark: if you are writing a script for someone else’s course, make sure the review your script before going into production. In many cases an inspiring teacher is both a real passionate expert in her or his area of expertise, and a great story teller. This means the content they provide is relevant, timed in accordance to the content that needs to be delivered in a specific time frame, and it is coherent. The content that is provided needs to be (and look like) high quality material (evidence-based, well structured, and be open to some sort of assessment). Get an idea of all the ‘actors’ in your course. Which elements are at the core of your course, how can you make them more interesting? How can you use these actors to build a course? (eg. Energy is the ‘good’ guy, while an earthquake can disrupt the energy equilibrium, in that case the earthquake can be the ‘bad’ guy, and as such become part of a narrative to make a specific part of the course more intriguing. Create a learning journey and make it compelling. Provide narrative throughout the course: if the course has elements which flow one to the other, try and find a narrative that feels natural to these steps. Try to find an authentic learning context, related to actual cases in the field, and distill an overarching story from that: “All was well on the island of Eden, the energy that was used was stable and people used that source of energy for transportation, food production and general comfort. Then the unthinkable happened and due to a power breach, the island was cut off from its main energy supply. Unfortunately it was in the middle of winter so priorities needed to be set in order to safeguard the islands citizens…. And from there different case studies with solutions, or different approaches can be shared as content modules. Remark: sometimes this umbrella story that can embed content from all the modules given in the course, only starts to emerge once you see the modules of the course itself. Keep it poignant. Although a narrative is built, all the content should be brief, consize and relevant. In a classroom you can elaborate, learners do not dare to leave an auditorium, but if a video is elaborating too much or not getting to the point, learners simply move to the next bit of information. Therefore, it is good to constantly ask yourself: which message do I want to put across, what is at the core of this content, and what do I want the learner to get out of this section. If you feel that more information needs to be provided, consider adding it as additional reading. Use clear structure. A story needs to have a beginning (situating what is to be expected), a middle (where you gradually go deeper into the content, takes more time. Needs sign-posting in between modules for ease of learning), and an end (wrap up with conclusions, recapturing what is said and consequently should be learned). Provide authentic scenes and situations. Are there elements in the course that can be used as visual extra’s? For instance, do not talk about lab work, but show a lab while explaining something. Are you particularly happy with a new invention, show the invention. Did you create a new model or design, show the design. . The teaser should be truthful to the content that can be expected (mention the big lines, or big topics/modules). This means that the topics listed, should be part of the actual course once it starts. It also means that the teaser should be a representation of the other audiovisual media in the course (do not use high-impact simulations in your teaser video, if you are not planning to use them in your actual course). Trigger interest. Remember that an idea that is not concluded, is an idea you keep in your mind for a longer period of time. So provide some open questions, or open ideas in the teaser… challenges or enigma’s that might trigger curiosity in the potential learners, yet will only be answered in the course. Some locations provide additional meaning to a video. Adding a meaningful location can add to the authenticity of learning by using a real life location to describe particular content. If you talk about a particular part in the process of a windmill energy park, it becomes more meaningful if you show that part in action while describing it. These recordings integrate an additional tool is to add a virtual reality simulation that can be seen using virtual goggles of any kind to really get a feeling of what that particular plant looks like.